The last few days have been busy ...cafes, walking, baking, shopping, plus we have our daughter-in-law staying this week which is lovely. And now of course tomorrow I have 3 days "playing" with my granddaughter from 6:30am - 4pm while mum & dad go to work. I know for some people when they retire there can be such a huge void, so I feel very priviledged to be spending this time with her. I did manage to squeeze in some sewing time too which is always a nice bonus, and I actually finished up a few small things as well! .......I made a Liberty pin cushion for our Monday Modern group's Secret Santa prezzie. I found lots of ideas in my book Liberty Love by Alexia Marcelle Abegg, and I see that Rita over on Red Pepper Quilts is also making pin cushions too......heaps of them!!! .......I finished sewing the binding on my charity quilt so it's all ready to hand in at our next meeting. .......I also made a few more zig zag blocks. There are actually 2 slightly different, but v.easy blocks, block A & block B, mirror images. So one row is made of all block A's but each block is rotated across the row, and then the second row is block B, again rotated. Nifty eh? Don't look too closely ....there are some v. old fabrics included!!!!! My main focus is ensuring there is a strong downward flowing zig zag effect. Will do a reshuffling of blocks when I have made enough no doubt. Loving it so far thou'! organising a fabric collection - not!! I am messy I admit it!! I want to make quilts that I love making, & using, & giving, and I want to use every last bit of the fabric I have here at home!! I know I don't store/ create/ sew in an orderly fashion.....AND I have found that sometimes it's v. tricky searching for that one particular fabric...you just know it's there, but where ??!?!??!!? I did try to sort my stash out one day ages ago with the view of getting things under control. 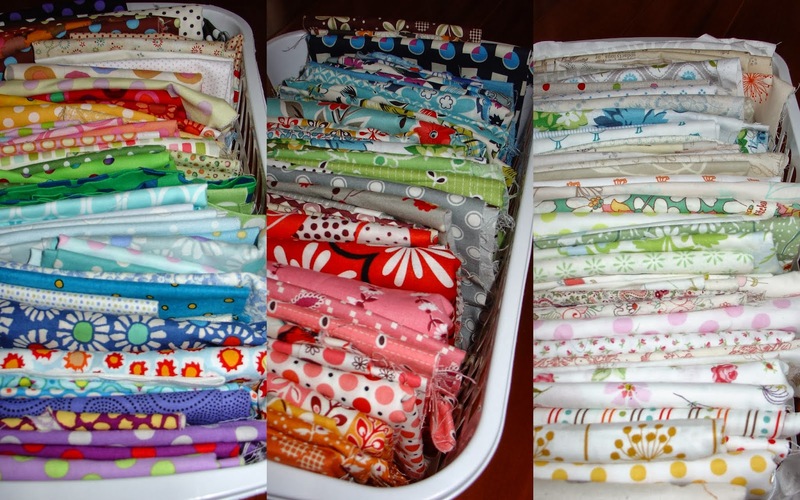 I had read that book "Sunday Morning Quilts" .....sort, store & use every last bit of your Treasured Fabrics. Hey, that sounded just like me!!!! no matter what fabric colour/ age/ collection/ designer.... I keep it, & do try to mix it all up, & do try to use it. There was a whole section in the book about sorting your scraps, and they recommended sorting by colour which seemed to me like a really great place to start. So I purchased several more white plastic containers from the supermarket & began to sort! I must confess, it was a bit over whelming.....I have ugly fabrics from way back, fabrics that I love & use over & over, fabrics I never use, & fabrics that, sadly, are just background fill ins or it'll- do- type of fabrics!!! BUT no matter, scrap quilting to me is about using all of this lovely fabric!!!..... somehow, somewhere.....and making something pretty & useful out of all the bits & pieces that are causing a right mess in the spare bedroom!!! easily at hand (either from shops or via internet), and it's all so overwhelmingly inspiring?!?!?! I had made a great start on my "to-do-list" the other day, and thanx for the comments in my last entry! There I was, happily quilting my Liberty Squares quilt, nothing fancy, but satisfying ........when I suddenly remembered that I hadn't made the 2 blocks for the BOM 40 Shades of Grey!!!! and month 3 BOM will be arrivng in the post any day now!!!! So today was the day!! And they took some time to do I must admit. The first one began to have a manic "out of kilter" feel to it as I went round & round, but then I began ironing as I went - which the instructions actually advised to do - and things turned out just fine!! Yep, I am now officially "retired" !! A wee bit early I know but.........an offer came up I couldn't refuse!!! So, after a few days away down at the bach at Waihi Beach, I am now catching up with washing/family/blogs, etc. AND thankfully, I see that others are just like me......UFO's lurking everywhere!!!! i.e. 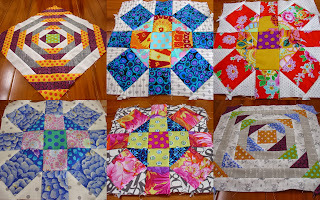 Un Finished Objects, or quilt tops!!!!! http://filminthefridge.com/ see Taking stock once again. We chatted at our last Monday Modern meeting about how many things people had on the go at any one time. And of course we all work v. differently - and have different stashes, different budgets, different priorities, etc. I think in all honesty, I have a v. short attention span!!! I know I certainly love all the planning, all the sorting out of fabrics, all the sewing....but then once I see the end in sight ...I stop!!!! 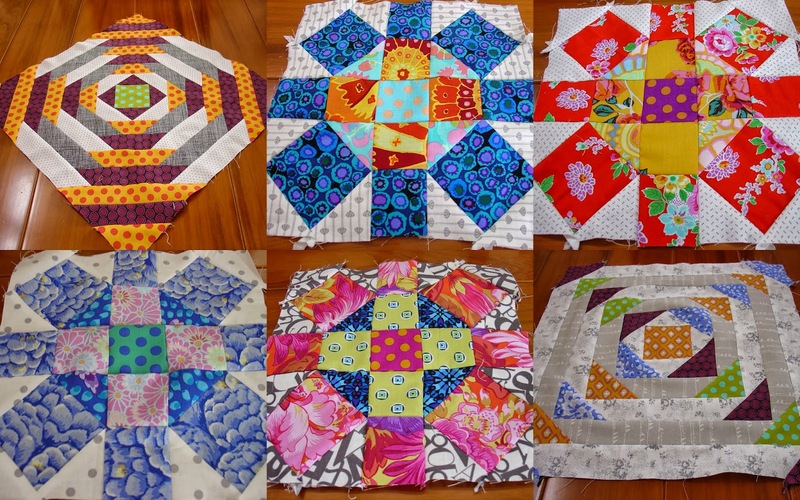 Our tastes change over the years, and being part of the Monday Modern group has certainly added a new dimension to my patchwork & quilting. But I do still need to finish a few things first! Want to see what's in my UFO pile? Anyway, now I'm "retired" I am going to do my best to cross a few of these from my to-do-list. Any votes on where to start first? This little lovely is my Liberty Squares quilt and only requires some quilting & binding & then it's done!!! H-m-m-m- this one was a KF project, but all pastels, and needs batting/backing/quilting/binding!!!!! Oh dear....this one I made ages ago!!! But I kinda still love it!! 30's fabrics, and still needs batting/backing/quilting/binding! will it be an heirloom one day?!?!?!?!? Well this one was v. easy to piece .... the orginal idea was to piece the background then applique dresden plates on top, but I felt the background was enough as is (!!!) & so I never actually finished any of it!!!! And now I see, this fabric range is actually back on the market again !! So.... just a quilt top that needs ...you guessed it.... batting/backing/quilting/binding!!!! Ahh-h-h-h now this wee one has batting & backing ...it simply just needs quilting & binding!!! Oh, and ......a little someone who needs a quilt!!!! !